WHAT IS OUR COFFEE SUBSCRIPTION? Our coffee subscription is a program designed to make finding and purchasing whole bean coffee much easier. For anyone who makes coffee at home, the worst feeling is waking up and finding that you have no coffee to brew. You could have gotten it when you popped into the café, but you forgot. 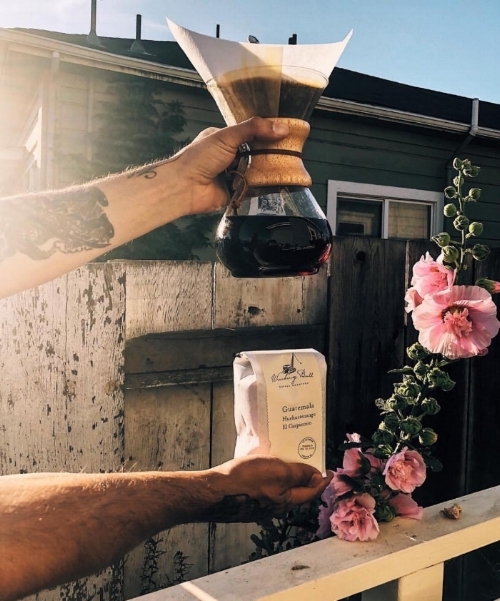 What we want to do is choose coffee for you based on your preferences that you have given us and depending on how often you need coffee (once a month or every other week) put aside a specific bag from the many talented roasters we are connected with, just for you. When you come into the café you can pick up your bag, grab a free drink on the house and know that you’ll have coffee waiting for you at home when you have guests over or just want to stay inside and be an introvert for a day (we don’t blame you). What else is good about this? We work with different roasting companies such as Vertigo Coffee Roasters, Cat and Cloud Coffee, Wrecking Ball Coffee Roasters, Proyecto Diaz, and many more to come- so you know that you'll always be getting something a little different or similar based on your preference. If you need your coffee ground up for a specific brewer, we can take care of that for you too. We will also sometimes throw little surprises in your bag for you, so you never know what you might find. You will also be the first to know what coffees we will be featuring and when. If you have a specific company in mind we can even reach out to them to see what we can do. 1. We will keep a form of payment on file attached to your customer profile. 2. When it is your week to run the payment, we will send out an email to notify you that we will be charging the account. 3. That next Monday (Typically when we get our new coffees), your subscription will be waiting for you to pick up for the week. 4. Come into the café, pick up your subscription, and grab a free drink. Email us at calaveracoffee@gmail.com titled "Coffee Subscription" We can give you more information, answer any questions, and we will have a few for you as well. Thank you!